Nearly a century has passed since the foundation for modern-day comic books was created in the United States. Although comics had existed within newspapers and magazines, “Funnies #1,” published in 1929, was the first stand-alone collection of comics. Today, the Miss Anthology project in Portland is taking that creative foundation and using it to “support racially and economically diverse female and genderqueer youth” by teaching comics and publishing their work. Miss Anthology publishes the works of young female and genderqueer comic artists. Co-founded by Melanie Stevens, Emily Lewis and Mack Carlisle, Miss Anthology is made possible through grant funding from a variety of sources, including the Precipice Fund and Andy Warhol Foundation. 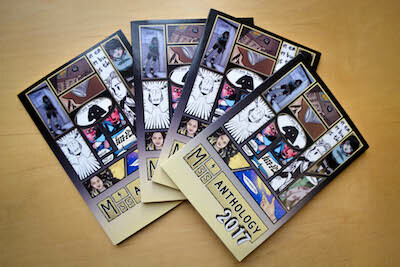 After a successful summer of workshops led by comics instructors and enthusiasts within the community, the first volume of Miss Anthology has finally come to fruition. A handful of the newly published youth authors joined Stevens at the Rose City Comic Con the weekend of Sept. 8-10 to showcase their work. While publishing their stories is one component of the Miss Anthology project, Stevens said the other major component is education. In its inaugural programming, up to 15 students – most of them new to the art form – were invited to delve into the world of comics over an eight-week course. Beginning with comic origins and history, each workshop focused on a unique element of comics and slowly introduced techniques and new materials. “Each student got their own sketchbook, a Pigma Micron pen and graphic pencils. We just kind of wanted to sort of whet their appetites for how to begin the process of making these comics and making these stories,” Stevens sa. Although she’s now a talented illustrator and writer with a Master of Fine Arts from the Pacific Northwest College of Art, it wasn’t until college that Stevens remembers picking up her first graphic novel. Stevens was raised in Atlanta, Ga., and recalls having created art for most of her life. While she’d spent some time working with youth in collaboration with the Boys and Girls Club, this was the first time she’s worked so closely with youth and for an extensive amount of time. The landscape that Stevens refers to is the comics industry, which remains severely homogeneous. When examining DC Comics and Marvel, comics historian and researcher Tim Hanley found that as of 2014, there were eight times as many male creators as there were female. Furthermore, 79 percent identified as white. By focusing on youth who are underrepresented within the comics industry, Miss Anthology hopes to propel them into a network of supportive peers and professionals. As the group geared up to debut its finished product at Rose City Comic Con, Stevens said the six artists who submitted for Miss Anthology were budding with excitement. Stevens hopes that by next year, more youth will get involved and those who participate in their workshops will feel encouraged to submit. Instead of printing 100 pages of content again, Stevens said, Miss Anthology 2018 would like to see that number doubled.